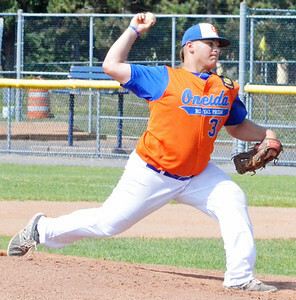 Photos from Oneida Post's run to the New York State Junior American Legion Baseball championship game. KYLE MENNIG - ONEIDA DAILY DISPATCH Oneida Post's Sam DiGeorge delivers a pitch to a Clinton County batter during their game in the American Legion Junior Baseball state tournament in Rome on Friday, July 29, 2016. 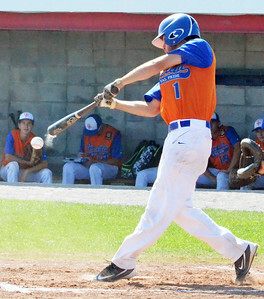 KYLE MENNIG - ONEIDA DAILY DISPATCH Oneida Post's Ty D'Arcangelis connects for a single against Clinton County during their game in the American Legion Junior Baseball state tournament in Rome on Friday, July 29, 2016. 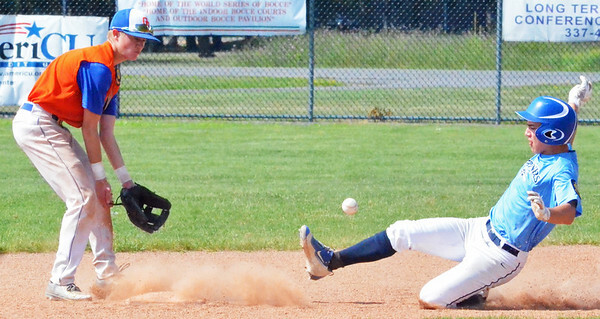 KYLE MENNIG - ONEIDA DAILY DISPATCH Clinton County Jr. Mariner Noah Lederman, right, slides safely into second for a stolen base as Oneida Post's Ty D'Arcangelis fields the throw during their game in the American Legion Junior Baseball state tournament in Rome on Friday, July 29, 2016. 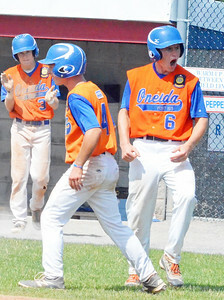 KYLE MENNIG - ONEIDA DAILY DISPATCH Oneida Post's Henry Froass (6) reacts after scoring the go-ahead run against Clinton County during their game in the American Legion Junior Baseball state tournament in Rome on Friday, July 29, 2016. 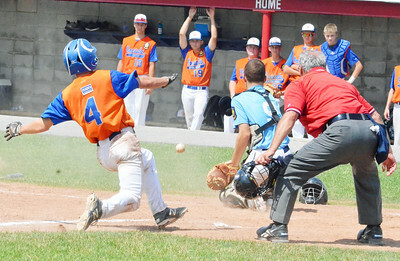 KYLE MENNIG - ONEIDA DAILY DISPATCH Oneida Post's Lukas Albro (4) slides safely into home as the ball gets away from Clinton County catcher Liam Rascoe (9) during their game in the American Legion Junior Baseball state tournament in Rome on Friday, July 29, 2016. 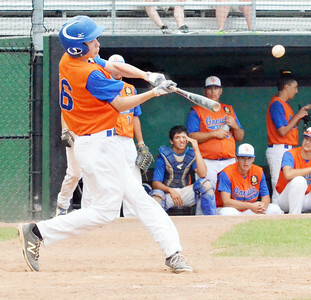 KYLE MENNIG - ONEIDA DAILY DISPATCH Oneida Post's Vinny Leibl hits a ground ball against Fort Orange Post during their game in the American Legion Junior Baseball state tournament in Rome on Friday, July 29, 2016. 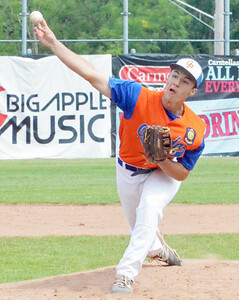 KYLE MENNIG - ONEIDA DAILY DISPATCH Oneida Post's Sam DiGeorge delivers a pitch to a Fort Orange Post batter during their game in the American Legion Junior Baseball state tournament in Rome on Friday, July 29, 2016. 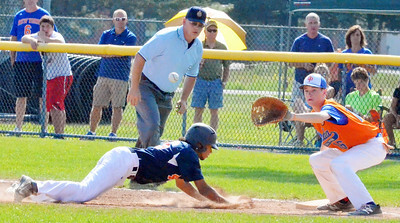 KYLE MENNIG - ONEIDA DAILY DISPATCH Fort Orange Post's Nicholas Esparra (46) dives safely back into first as Oneida Post's Danny Myatt (16) awaits a pickoff throw during their game in the American Legion Junior Baseball state tournament in Rome on Friday, July 29, 2016. 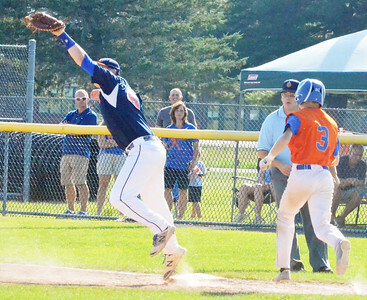 KYLE MENNIG - ONEIDA DAILY DISPATCH Oneida Post's Zach LaQuay slides safely into third against Clinton County during their game in the American Legion Junior Baseball state tournament in Rome on Friday, July 29, 2016. KYLE MENNIG - ONEIDA DAILY DISPATCH Fort Orange Post first baseman Matthew Wilson (44) stretches to catch the ball and force Oneida Post's Ty D'Arcangelis (3) out at first during their game in the American Legion Junior Baseball state tournament in Rome on Friday, July 29, 2016. 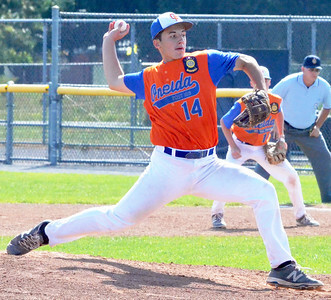 KYLE MENNIG - ONEIDA DAILY DISPATCH Oneida Post's Sam DiGeorge delivers a pitch to a Vestal Post batter during the New York State Junior American Legion Baseball championship game in Utica on Saturday, July 30, 2016. KYLE MENNIG - ONEIDA DAILY DISPATCH Vestal Post's Owen Dando (12) dives to tag out Oneida Post's Lukas Albro (4) trying to advance to second on a wild pitch during the New York State Junior American Legion Baseball championship game in Utica on Saturday, July 30, 2016. KYLE MENNIG - ONEIDA DAILY DISPATCH Oneida Post's Jorden Barlow (13) tags Vestal Post's Shawn Chermak out at the plate during the New York State Junior American Legion Baseball championship game in Utica on Saturday, July 30, 2016. 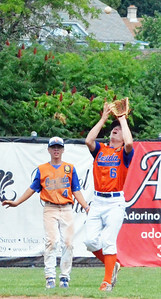 KYLE MENNIG - ONEIDA DAILY DISPATCH Oneida Post's Henry Froass (6) reaches to make a catch to retire a Vestal Post batter during the New York State Junior American Legion Baseball championship game in Utica on Saturday, July 30, 2016. 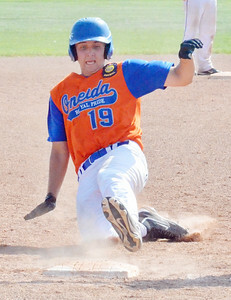 Backing up the play is Oneida's Lukas Albro. 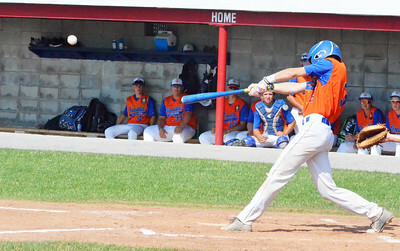 KYLE MENNIG - ONEIDA DAILY DISPATCH Oneida Post's Danny Myatt connects for a single against Vestal Post during the New York State Junior American Legion Baseball championship game in Utica on Saturday, July 30, 2016. 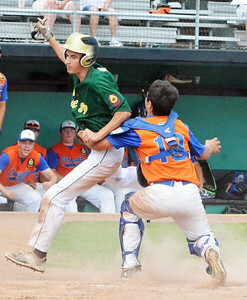 Vestal Post's Owen Dando (12) dives to tag out Oneida Post's Lukas Albro (4) trying to advance to second on a wild pitch during the New York State Junior American Legion Baseball championship game in Utica on Saturday, July 30, 2016.